I keep meaning to make food posts here; I have a few saved up in my mind that I still haven't written out. But last night and this morning I made maple ice cream with candied walnuts and that reminded me that I wanted to say something about ice cream. First of all, ice cream isn't just for summer. Out here in the west it is - my favorite scoop shop in town closes down after the summer tourist season is over - but I grew up in the east, and went to grad school in the Boston area, which has (I read somewhere, and I can't find the statistic again, but this article pretty much describes it) the highest per-capita winter consumption of ice cream in the US. This summer I bought an ice cream maker attachment for my Kitchen-Aid stand mixer, and I have made a lot of ice cream since then. I started out by trolling the web for recipes, and that's still pretty much how I make new flavors, but with one exception; I pretty much always make the basic ice-cream part of it using Ben and Jerry's Sweet Cream Base, sometimes modified to account for other ingredients. (For example, for the maple ice cream I used this recipe as a starting point, so instead of the 3/4 cup sugar I used the reduced cup of maple syrup.) It doesn't really matter if the sweetener is mixed first with the eggs or the milk/cream, so I do what works with the recipe and ingredients. I also use 1.5 cups each of milk and cream, rather than 1:2. There are two things I really like about this base recipe. First, it uses whole eggs, so I no longer have to come up with creative ways to use up the whites. (I mean, I love coconut macaroons, but I was getting tired of them...) Second, the texture has so far (we're talking 6 or 7 batches) been perfect. The ice cream I made with lots of yolks always seemed to be too hard when removed from the freezer, and I had to chip small hunks off rather than scooping up big spoonfuls. The salted caramel ice cream from Cooking Light (that should have been a clue right there) was unpleasantly grainy. (But it tasted awesome, and I have since made it again with the sweet cream base, and oh, YUM.) The peach ice cream that I made with whipped egg whites (don't ask) was HORRIBLE. But all of the ice creams I have made using variations of the sweet cream base have been tasty, creamy, and when I pull the container from the refrigerator, the exact consistency to scoop out easily. Huh, I wonder why it's called that? :-) It's actually a semi-detached point at the southeast end of a long, flat lump of rock called Graysill Mountain, connected by a skinny ridge. 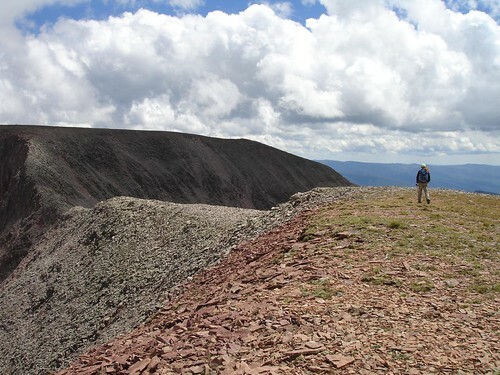 (In this photo, I'm standing at the end of Graysill looking at the ridge and the Grayrock summit.) We had actually tried to climb it from the east last year; we'd gotten lost and ended up wandering around a cliffy steep face that was no fun at all before picking our way down again. This time we drove around to the southwest and hiked up an old, closed logging road that eventually petered out into a trail, which eventually disappeared entirely, but by that time we were above treeline and just aimed for the high point. The slopes of Graysill from where we parked around 10,200 to a bit above treeline were thick with mushrooms. This has been a banner year in Colorado for wild mushrooms. Last Sunday we went on a dayhike specifically to look for and collect them, and we came back with something more than 20 pounds of mostly Hawk's Wings and King Boletes (as well as a few random samples of other things to try or investigate); on our way down from the peak, we collected Saffron Milkcaps (Lactarius deliciosus) and King Boletes (Boletus edulis). Our dehydrator has been running nonstop, and we've been eating mushrooms with nearly every meal, yum! For whatistigerbalm, who wanted to know about bread pudding, and anyone else who is into the OM NOM NOM NOM. I swear I don't just eat desserts. Today was a chilly, rainy morning, so I made kitchen-sink soup for lunch, this version consisting of onion, garlic, potatoes, lentils, the last of the scaly urchin mushrooms we collected on Saturday, and various spices: cumin, sage, thyme, and a whole lot of black pepper. I blenderized about a quarter of it and mixed it all up and had it for lunch along with a small glass of port, because there is something about lentil soup and port, and besides, I needed it for medicinal purposes (aka That Time of Month). Seriously awesome. Hey, guess what? It's almost time for dinner!